Karen is a military wife and a new blogger friend, and she has written a beautiful post, I hope you will go check out her blog after you read! I didn’t always h ave the faith I do now. Growing up I questioned the hypocrisies within the church and the (seemingly) sexist nature of the practices. As I matured, I began to realize the hand human nature has in religion and learned how to incorporate my personal faith with the non-perfect church. My faith is a quiet faith. My clearest moments oftentimes occur during the darkest of times, and almost always while I am alone. My faith is just that – all mine. I am a positive person. I think complaining is a waste of precious energy and dwelling is nothing but inaction. To be fair, my life has been easy thus far. I grew up in a loving family, married into a loving family, and the good times have far outweighed the bad times. Life is good. My faith certainly has a role in my positive attitude. In my short life, I have learned that when I am met with an undesirable situation, I emerge okay. And usually a bit wiser. I can only hope. When Clay volunteered for his current position, he did so knowing he would deploy in the near future. When we decided to expand our family, we did so knowing he would miss the majority of the first year. When we said goodbye, we did so knowing the risk involved with his adventure. He is missing a lot. We’re missing a lot. When people discover that my husband is deployed, I am often met with widened eyes and “that’s terrible, how difficult for you.” Most of the time, I just smile and explain that it really isn’t that difficult and I sleep with bread. I don’t dare tell them we chose this path. Yes, I sleep with bread. I sleep with a clear mind and a heavy heart. I miss my husband terribly. But I have faith. I have faith that no matter what happens, we will all be okay. Our determination, stamina, and love has helped us achieve what most humans want most – not to be alone. We’re almost a quarter finished with the deployment. His packed suitcase from the 72-hour pass still sits in the closet, unpacked. A shirt of his, sprayed with cologne, wraps one of my pillows. His toothbrush is still in the holder. Sometimes I even accidentally use it and laugh. We email daily and talk on the phone every couple of days. I am healthy. Our son is healthy. And my husband is volunteering for a purpose greater than himself. 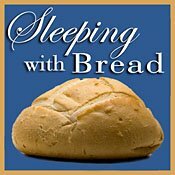 I am not alone, I sleep with bread. Beautiful post! Thanks for sharing Karen, I hope it will be an encouragement to other military wives! Please go check out her beautiful blog for more posts!